Almajdouie Logistics World, at Ras Al Khair, Saudi Arabia, moved an evaporator unit weighing 4,015 Tonnes (4,425.78 Tons) by road freight. 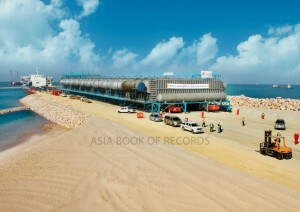 This is the heaviest object moved by road freight in the world. Comments for HEAVIEST OBJECT MOVED BY ROAD FREIGHT are now closed.